William Hedley, Junior (son of William Hedley). 1813. Exhibit at Beamish Museum. Published in 1876. 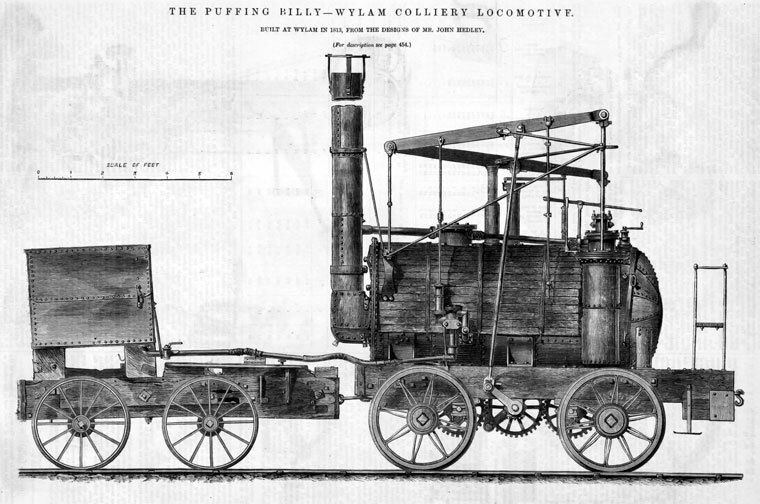 The Puffing Billy, built between 1812 and 1814. William Hedley (July 13, 1779 – January 9, 1843), a colliery viewer and lessee, was one of the leading industrial engineers of the early 19th century, and was instrumental in several major innovations in early railway development. 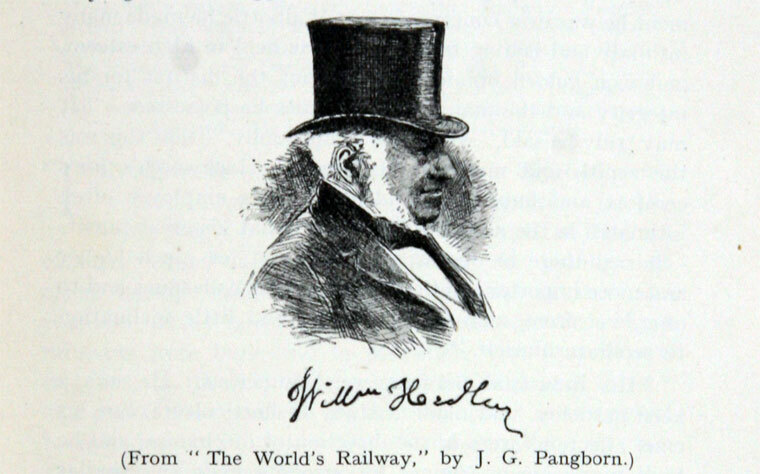 While working as a 'viewer' or manager at the Wylam Colliery near Newcastle upon Tyne, he built the first practical steam locomotive which relied simply on the adhesion of steel wheels on steel rails. He was born in Newburn, near Newcastle upon Tyne in 1773. Before Hedley's time, such locomotives were far too heavy for the track that was then available. While most lines used cable haulage with stationary engines, various other schemes had been tried. William Chapman at the Butterley Co in 1812, attempted to use a steam engine which hauled itself along a cable, while, at the same company, Brunton had produced the even less successful "mechanical traveller", or Steam Horse. However, in 1812, Matthew Murray and John Blenkinsop had produced the Salamanca, for Middleton Colliery near Leeds, using a pinion engaging with teeth along the track. This had been the first engine to work successfully, but the system was complex and expensive. Hedley felt that if the pairs of wheels were connected, as with Richard Trevithick's engines, if one pair began to slip, it would be counteracted by the other. The mine owner, Christopher Blackett had just replaced the wooden waggonway with iron 'L' section plate rails. Hedley first constructed a test carriage operated by manpower, to test the adhesion under various loads. He then used it as the chassis for a locomotive constructed to Trevithick's pattern with a single cylinder and a simple straight through fire tube to the boiler. This engine was not satisfactory. Its motion was erratic, because of the single cylinder, and it produced insufficient steam. He built a second engine, with the assistance of the, later to be famous, Timothy Hackworth, his foreman smith, and his principal engine wright, Jonathan Foster, using the twin cylinder plan of John Blenkinsop and a return tube boiler. This was the famous steam locomotive, Puffing Billy which first ran in 1813 and is now preserved at the London Science Museum. 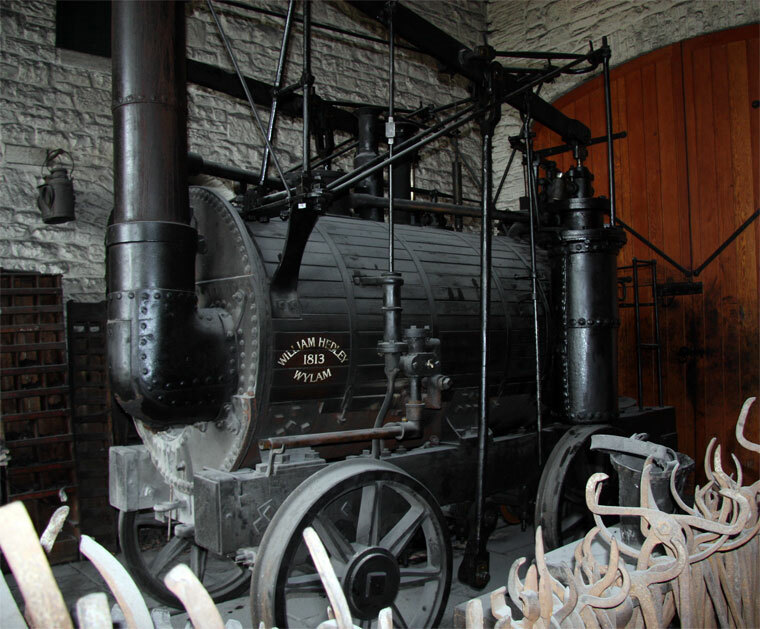 Its success encouraged them to build a second engine Wylam Dilly, which is now in the Royal Museum of Scotland. In the same year, his system for using a coupling between the wheels was patented. However there was still considerable wear to the track, and the engines were rebuilt using twin four-wheeled bogies, introduced in Blackwell's design mentioned above. Initially the wheels were without flanges for use on the plate rails. In about 1830 the line was relaid with edge rails, and both locomotives reverted to their original pattern, but with flanged wheels, which is how they are today. Both locos remained in active service until 1862. 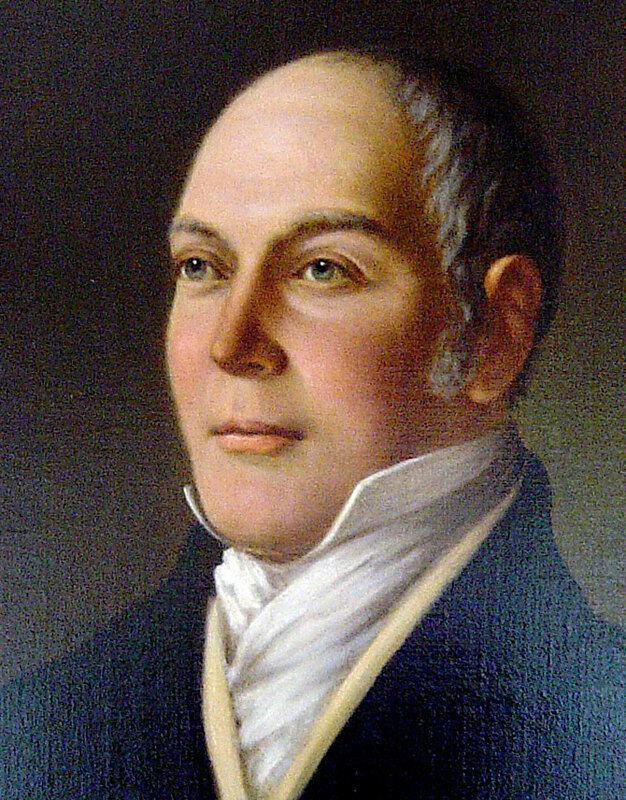 Hedley died in 1843. He had 4 sons - Oswald Dodd Hedley, Thomas Hedley (1805-1877), William Hedley (1808-1888) and George Hedley (1809-1886). His descendants remained heavily involved in the coal-mining industry until nationalisation in the 1940s. In 1971, a charitable foundation was set up in the Hedley name, with assets based on the compensation from nationalisation. This page was last edited on 23 April 2018, at 16:35.